The Israeli bandage battle dressing is a must have first-aid device in a survival situation that is used to stop bleeding from hemorrhagic wounds caused by traumatic injuries including gunshot wounds. Learn how to apply an Israeli Bandage by watching the instructional videos below. For years, one of the most preventable causes of deaths in non-fatally wounded people has been the inability to quickly and effectively stop bleeding. 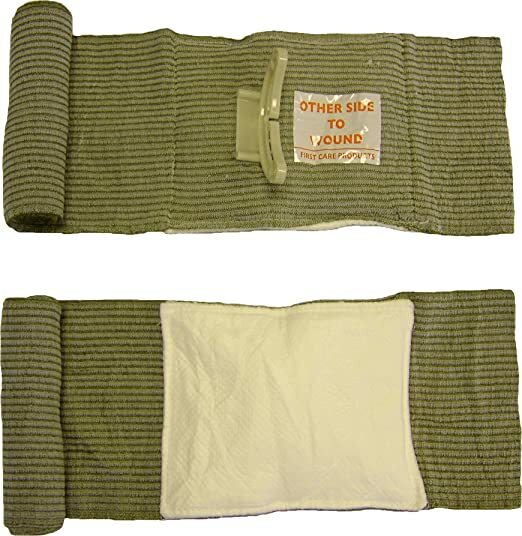 The Israeli bandage began distribution in 1998 and afterwards the US military started using this bandage successfully, and they have been the first aid bandages of choice for the US Army and special forces. The Israeli bandage is an emergency elasticized trauma dressing that has a sewn in non-adhesive bandage pad. The bandage includes a built-in pressure bar, which allows you to twist the bandage around the wound once, and then change the direction of the bandage, wrapping it around the limb or body part, to create pressure and compression on the wound. The pressure bar concentrates pressure on and compresses the wound and also makes bandaging easier by making it easy to reverse directions. A closure bar at the end of the bandage allows for a non-slip tie off for the bandage. The Israeli bandage can be used to stop bleeding in wounds on the arms, legs, mid section, and head. It can even be used as a tourniquet. The original Israeli bandage design comes in three different sizes: 4, 6, and 8 inches wide. There is also a 12" Israeli bandage specially designed for abdominal trauma, and other Israeli bandages are available that have two pads to stop bleeding for gunshot entry and exit wounds. Having multiple sizes and types of these compression bandages in your first aid medical kit would be a great asset in a long term survival scenario. Although Israeli bandages come in a package that has instructions on the outside, there are different applications of Israeli Battle Dressings that are not included in the instructions. I highly recommend that you view the excellent YouTube video below on the different applications of applying and how to use an Israeli bandage. The following YouTube video demonstrates how to use and Israeli bandage plus the different Israeli bandage applications and instructions. The following YouTube video provides tips, instructions, & demonstrates how to apply an Israeli bandage to stop bleeding from traumatic wounds by compression. The following YouTube video is another good video that provides Israeli battle dressing instructions and demonstrates the different applications of how to apply an Israeli bandage. "A must for a first aid kit. This is a fantastic addition to my emergency kit. Bandage and tourniquet all in one." "NO first aid kit should be without a couple of these...FANTASTIC product, and vacuum sealed for your hunting pack!" "This is undoubtedly the most versatile bandage invented. I carried these for 2 years in Afghanistan and now recommend them and the CAT-T (Tourniquet) to everyone involved in EMS and wilderness programs. Because the bandage is vacuum packed it takes up less space in a small 'Go kit' or in a larger backpack." "Great for preps. I think we should all have this sort of supply on hand in case of emergence. It could be man made or natural disaster like tornadoes - floods - earth quakes etc." "This product came very quickly, and is very high quality to use in combat situations. I highly recommend it for anyone wanting to use it in the field." "Love these, I keep several in my range bag, in my go bag and in my truck. Long shelf life, indispensable if needed, but hopefully won't ever need to be used." "If you come upon a serious accident, your car first aid kit won't help with any wound that is bleeding heavily. This bandage is specifically designed for just those needs." "Easy to use emergency pressure dressing. Pressure is the key to stop bleed outs. If you have never used one, directions are easy to follow." For more information on Israeli Bandages, refer to the following blog post by Dr. Ryan Chamberlin: What Preppers in Ferguson Must Know About Hemostatic Powders and Dressings. Scroll approximately one third down the page to the section called "Prepackaged Military Pressure Dressings". Use at your own risk. Please note that the information provided on this web page is for information only. TopSurvivalPreps.com and it's owner have no liability or responsibility for anyone using any items described on this web site including Israeli bandage battle dressings.